Mitt Romney before speaking during the Republican National Committee’s winter meeting aboard the USS Midway Museum on Friday in San Diego. Mitt Romney apparently still has a Thurston Howell III problem. If you listen to some commentators, Romney lost the 2012 presidential election because he wasn’t seen as caring about the average Joe (or, the average Gilligan). And Romney’s toe dip into the 2016 race has everyone talking about car elevators and offshore bank accounts — a conversation some GOP grandees don’t want to have again. But getting rid of Romney won’t get rid of the GOP’s empathy problem, and it’s not even clear how much of a problem it is. Romney, at 46 percent, was only the second Republican to have less than half of voters see him as caring about “people like me.” Yet, President Obama’s score on this question was also low historically, the second worst score for a Democratic candidate since 1984. Obama’s 14 percentage-point lead over Romney on the question (60 percent to 46 percent) was just 1 percentage point greater than average Democratic edge. Moreover, there isn’t an obvious relationship between how “in-touch” the candidates are and the election result. (In fact, the correlation between the Democratic edge on this question and the election result is zero.) For example, John McCain was seen to be as caring in 2008 as Ronald Reagan was in 1984, but Reagan won by 18 percentage points and McCain lost by 7 points. The bottom line: Republicans are always losing on this question. It’s called issue ownership; each party tends to do better on particular issues in the eyes of the public. Democrats may own empathy, but Republicans consistently score better on taxes and the federal deficit. Professors Helmut Norpoth of SUNY Stony Brook and Bruce Buchanan of New York University have found that “voters tend to rely too much on party stereotypes to notice such attempts” for a candidate to benefit from “trespassing” on the other side’s issue dominance. In other words, some of Romney’s Richie Rich gaffes may have reinforced the perception he was out of touch, but he probably would have been seen that way even had he avoided those miscues. 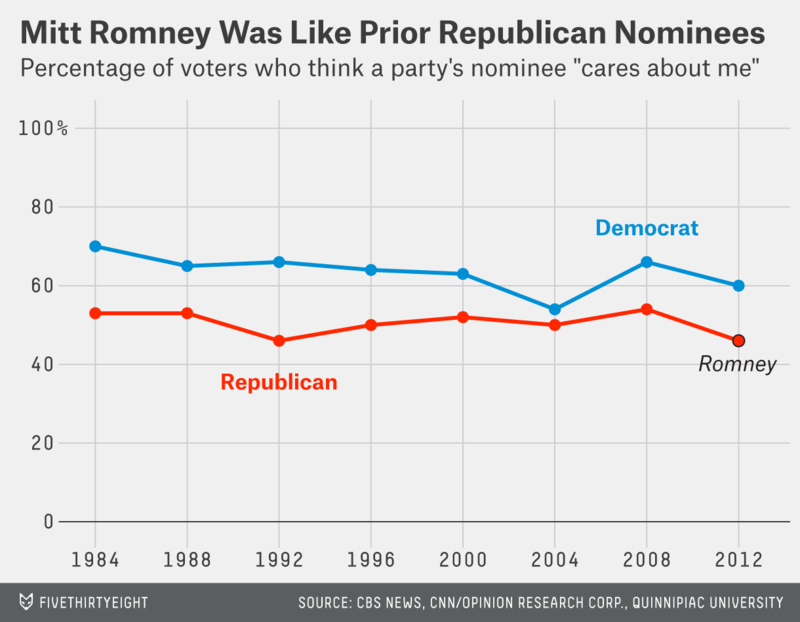 Indeed, there is little reason to think Romney should have won in 2012. Obama won the percentage of the vote predicted by economic growth and his approval rating. Romney didn’t beat expectations, but he didn’t fall short of them either. From 1984 to 2000, CBS News asked voters whether or not the major candidates cared about people like them. In 2004, it was Princeton Survey Research Associates International. In 2008, it was CNN/Opinion Research Corp. In 2012, it was Quinnipiac University.